Scott Nelis on Cajun at Red Bluff in a dry creek bottom. Red Bluff is one of the many impressive works of nature to behold at Pole Canyon Ranch. From 287 in Estelline turn west onto Highway 86. Stay on 86 into Turkey. In Turkey, 86 will turn to the right, stay on 86. Follow 86 into Quitaque, turn left by Allsups onto FM 1065. This is your last chance for a store or gas. Follow 1065 south, you will be going downhill for about 4 miles. Slow down as you reach the bridge at the bottom of the hill, immediately after the bridge turn right onto FM 689. Travel about 4 miles and Pole Canyon Ranch will be on your right. There is a metal Pole Canyon Ranch sign located at the entrance. 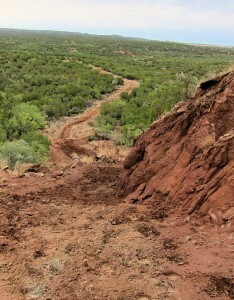 Pole Canyon Ranch entrance is off of FM 689. In front of the cottage are “check in” and “check out” boxes. A bathroom and shower is located and accessible from the side porch of the cottage (not the front porch). 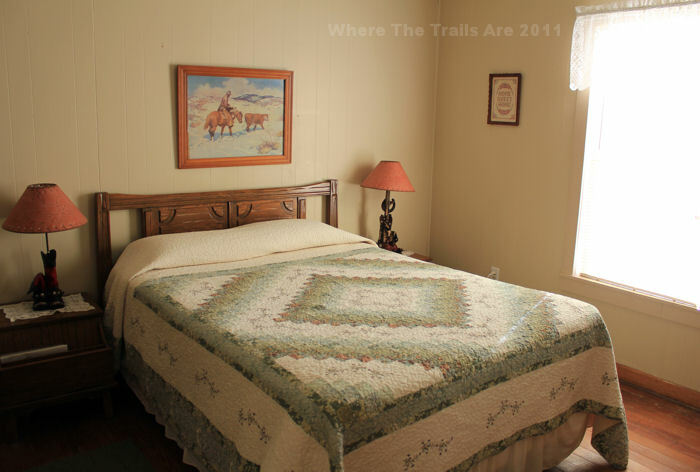 The bathroom and shower is available for all Pole Canyon Ranch visitors, you do not need to be staying in the cottage to use them. There is a separate shower/bathroom inside the cottage for the cottage renters. 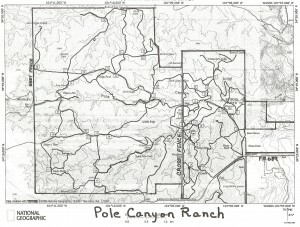 Pole Canyon Ranch provides twenty five uncovered 12×12 green paneled pens arranged in two rows. Each pen is spaced well apart and there are no shared panels between the pens. 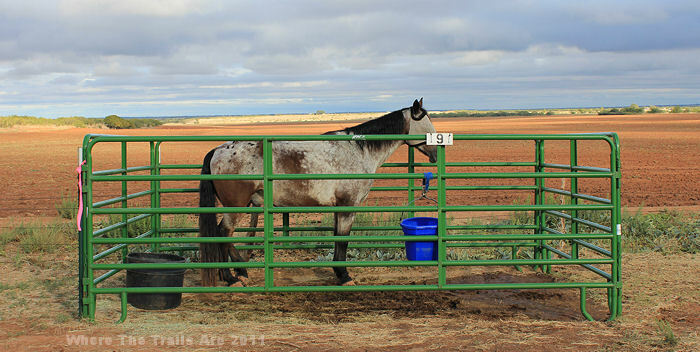 There is at least 4-6 feet between each pen so the horses cannot bite, kick, or touch each other when stalled next to each other. The panels are secured by locking pins and T-posts. Each pen has one large black bucket which can be used for water. When not in use the Ranch asks the buckets be emptied out and turned over. When finished with use of the pen, please clean out all manure and pitch it over the fence into the pasture. You may want to bring a hose for watering since there are only a few pens the water faucets will reach. There is ample space at Pole Canyon Ranch to maneuver a large rig and plenty of space for camping. There is a large open field for primitive camping. However, there are no near by running water sources in the open field so you will have to haul water from the RV parking area over to your camp site, or bring your own water. There is also no shade in this field as well. If you are not using the RV hook-ups, then the best place to park for convenience to water, shade, and the bathroom facility (located on the cabin’s side porch) is in between the house and the RV parking area. However, this spot is small and will only accommodate a couple of trailers. 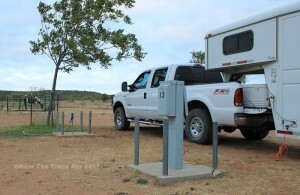 There are a total of sixteen RV/LQ electrical and water hook up sites. Eight sites have 20, 30, and 50 AMP connections and the other eight sites have 20 and 30 AMP connections. The water and electrical hook-ups are spaced apart and parallel to each other and are on concrete square slabs with four poles at each corner of the slab. The RV and LQ trailer parking is conveniently located between the two rows of pens. There are a few young trees in this area but they do not provide much shade. No septic dump stations are currently available. 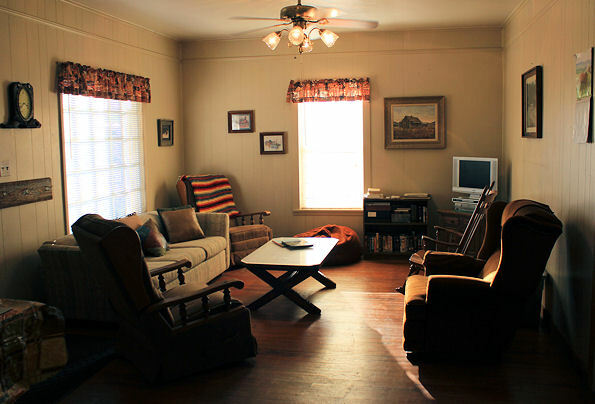 Pole Canyon Ranch has a three bedroom guest house which can be rented. 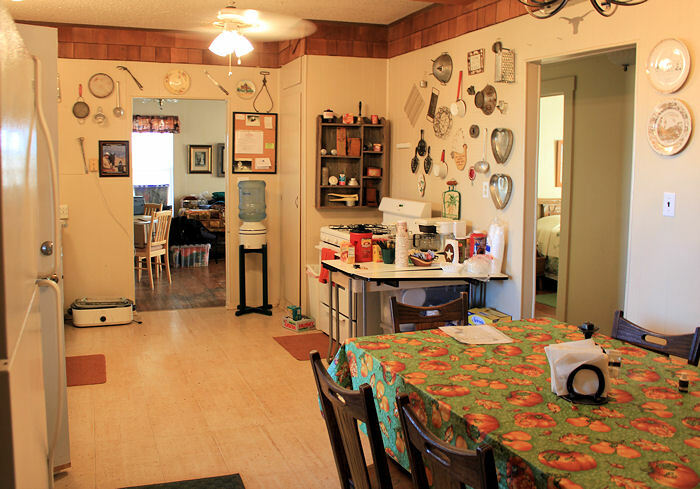 This home is one and a half stories with two bedrooms and a full bathroom downstairs and one sleeping area/loft upstairs. One bedroom has a queen size bed, the second bedroom has a full size bed and a twin bed, and the upstairs sleeping area has five twin size beds. Two of the twin size beds upstairs are in little cubby holes on the side of the walls and the mattresses for these two beds are directly on the floor. The home has a full kitchen, a laundry room, living area, dining room, front porch, and side porch. Pets are not allowed in the guest house but may stay in the chain link fenced in yard. Outside of the yard all pets are to be on a leash. 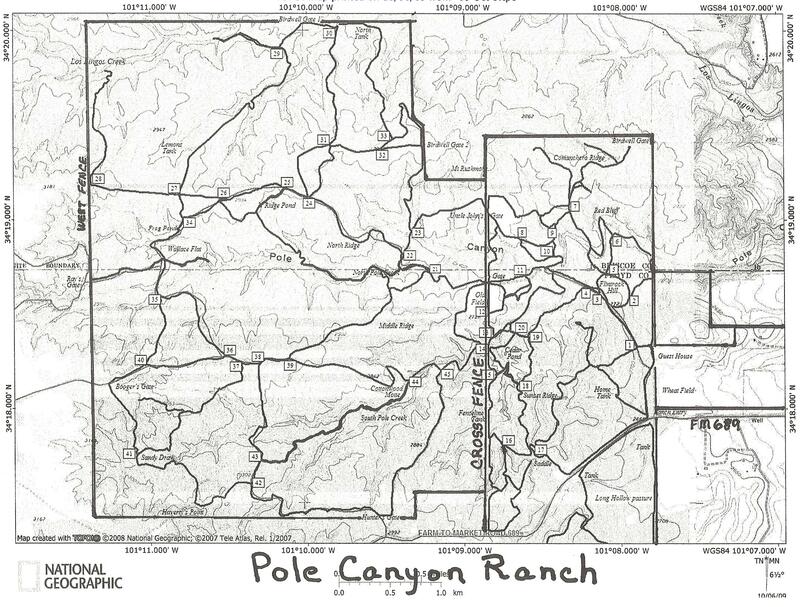 Pole Canyon Ranch consists of 6,000 acres and has approximately 40 – 50 miles of trail. 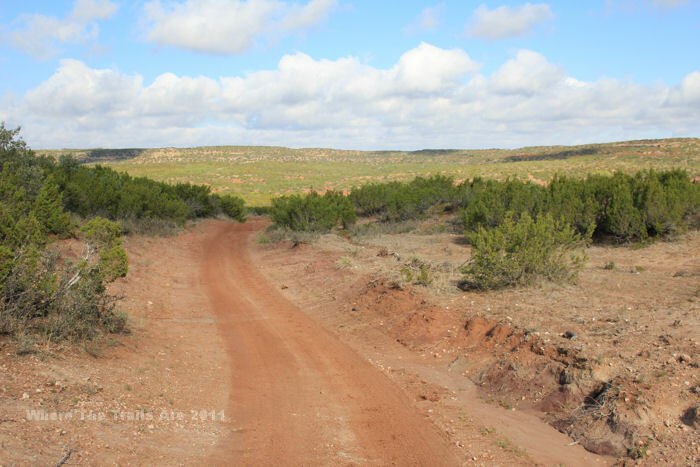 Terrain: The ranch offers varied terrain from flat stretches of trail to long hilly inclines and descents (some with steeper grades) making for fantastic views of the surrounding country. The ground is a type of red gritty sand which is a little like caliche and there are several types of rocks that vary in size and color. Some of the rocks are smooth and red just like the sand and can be hard to spot at times as they are well camouflaged, so keep an eye out for them as they can be slick, especially if it is wet. Shoes and/or boots are recommended. If you use boots check them to be sure the gritty sand is not getting between your horse’s skin and the boot as it would most likely rub or sore your horse. I usually use boots when the terrain is rough, but at this ranch I decided to see how my horse would do barefoot as the damp gritty sand was getting into her boots and she ended up doing fine barefoot. 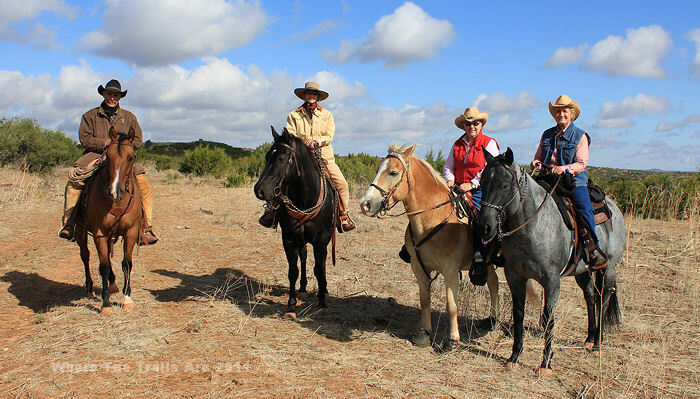 Pole Canyon, a family owned and operated ranch purchased a century ago in 1911 by the Taylor brothers, is steeped in folklore and the history of many people to include the Comanche, Comancheros, Charles Goodnight, and the Taylor family. 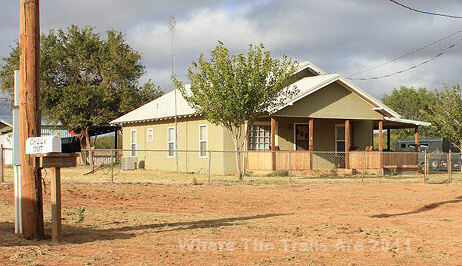 This ranch, partly owned and managed by Walter Taylor’s daughter and son-in-law, Lynnette and Phil Barefield, is part of the Walter Taylor Estate Ranches in the Texas Panhandle. A cattle operation continues to be active on the grounds. Vistas of Pole Canyon are seen through the eyes of many equestrians, cyclists, hikers, photographers, hunters, and nature enthusiasts thanks to the Taylor/Barefield family who have graciously opened up this red caprock jewel for others to behold. 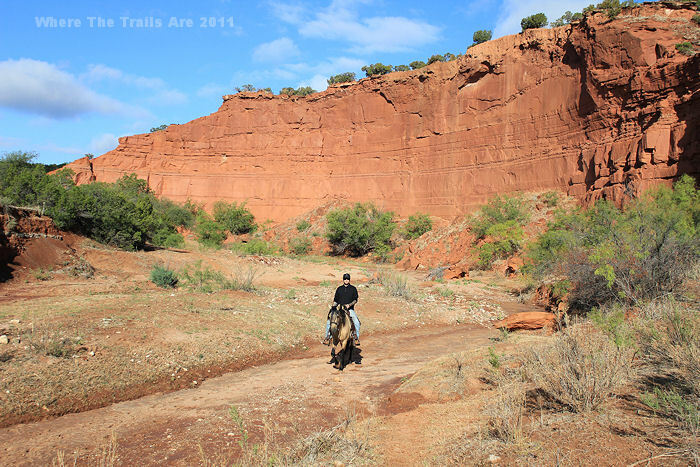 The miles of trails at Pole Canyon Ranch are quite diverse and offer amazing scenes of sandstone bluffs and long overlooks from the high Panhandle plains. 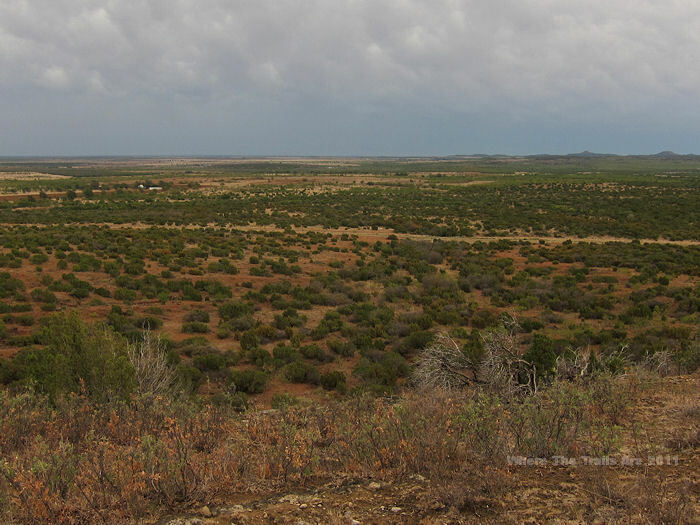 The land contains a multitude of plant life such as cactus, junipers, cottonwoods, mesquite, oaks, and grasslands. Most of the land is wide open, offering little shade. Due to the current drought, grass, wild flowers, and wild life sightings were slim but with one of the first significant rains of the season, the land was quickly coming back to life. Fellow equestrians said that just last year they rode through a field tall with sunflowers. Another fellow rider spotted an owl on the side of his caprock home and many round mud constructed swallow homes were seen engineered under the cliffs. The difficulty level of the trails range from novice to somewhat challenging with stretches of flatlands to rolling hills, long climbs and descents, and into more steep inclines, ravines, and somewhat rocky terrain. 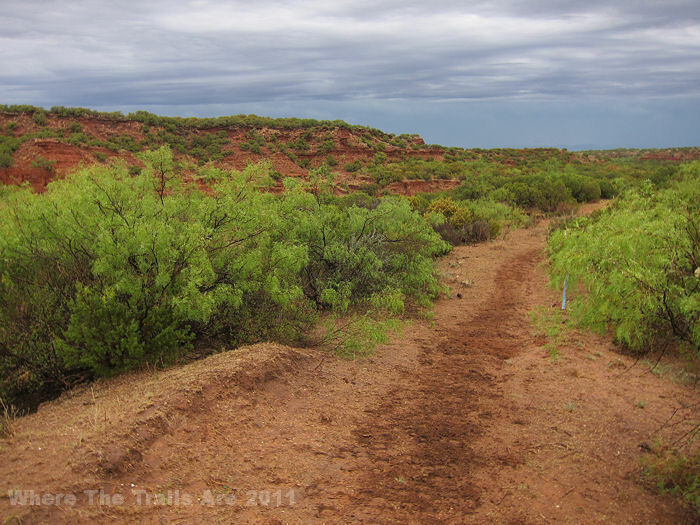 There seem to be two types of trails: two-track road-type paths and single-track trails. All of the trails I covered were clear and well maintained, and are marked by numbers. These numbers can also be seen on the trail map, which is very handy for figuring out where you are. 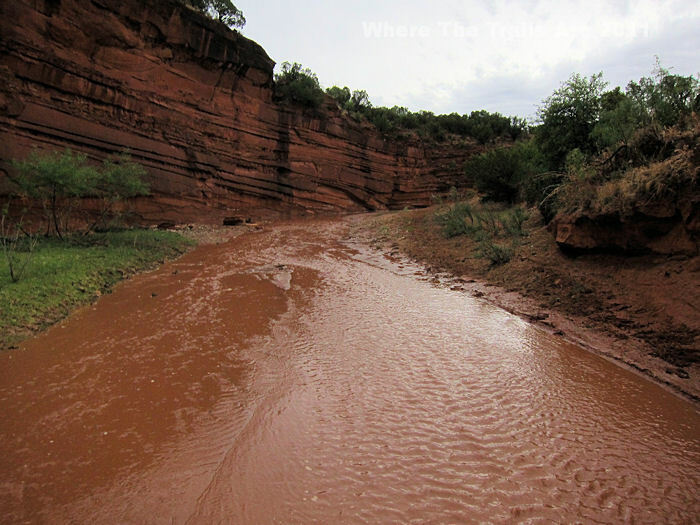 After Friday night and Saturday morning rains the once dry creek is now flowing with much needed water. 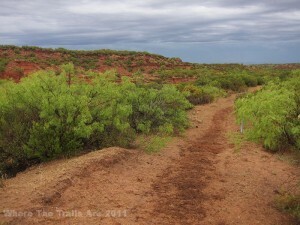 Texas Panhandle, covering approximately forty miles of trail. The long drive from south central Texas was well worth the payoff. My excitement increased as we grew nearer to the ranch. Pinkish red plumes of dust flew swiftly across the Farm-to-Market roads at the wind’s insistence and hung low in the horizon. I observed the ranch in a state of drought during my first trail excursion on Friday. Creek bottoms were bone dry, fields were bare, and it was very dusty. But later that night the skies opened up, lightning streaked overhead, and the clouds poured down much desperately needed rain. On Saturday the once dry creek beds were flowing again and there was a fresh crispness to the chilly air. 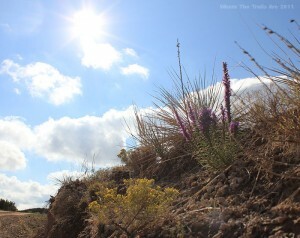 Sunday morning was misty, the streams were receding, and a few wild flowers made their appearance. By late Monday morning, most of the water was drawn deep into the thirsty earth and the rain clouds had cleared. That last ride on Monday was most enjoyable, as it was just my brother and me. 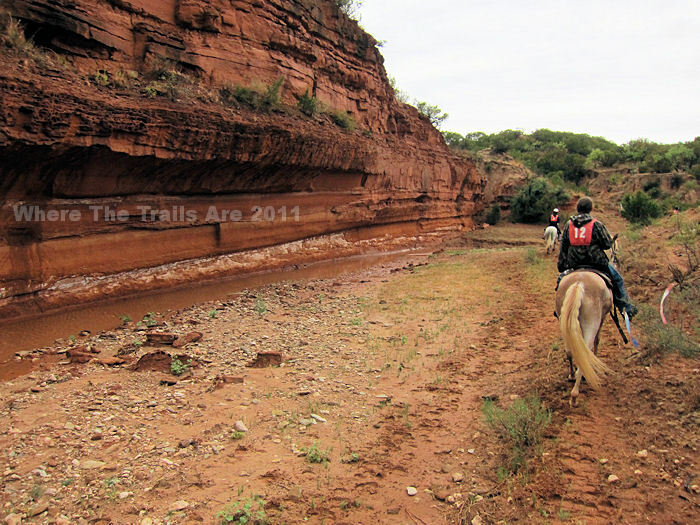 We had the place to ourselves with no clinic or competition to distract us from the caprock scenery. This was a short ride since we were also heading home later that day. We headed north to see “Red Bluff” once again , which easily became my favorite view and the most impressive sight for me at the Ranch. However, I’ve not seen it all yet as there were many trails I did not travel. 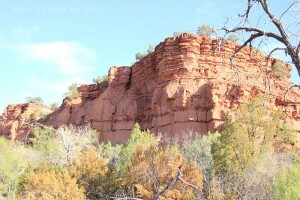 Returning to Pole Canyon Ranch to discover new scenes and admire previously viewed landscape is definitely on my agenda. Heading back to Red Bluff. On our way out we bumped into a group of regulars: trainer and clinician Brent Graef, his wife Chris, and riders Pat and Paulette. After our introductions they allowed me to snap a photo of them. They do look the part of Panhandle horsemen. 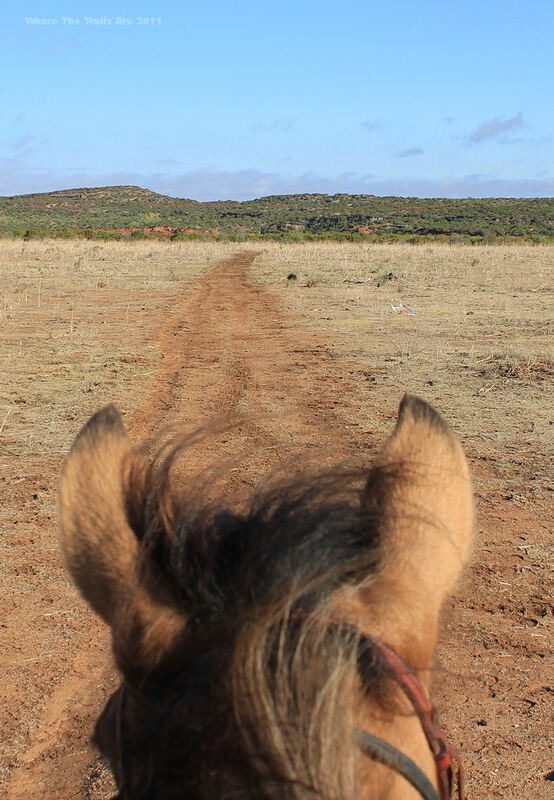 I realized later that a friend of mine had recently attended Brent’s week long trail riding clinic in the Texas Panhandle, and he had nothing but positive reports on the class. 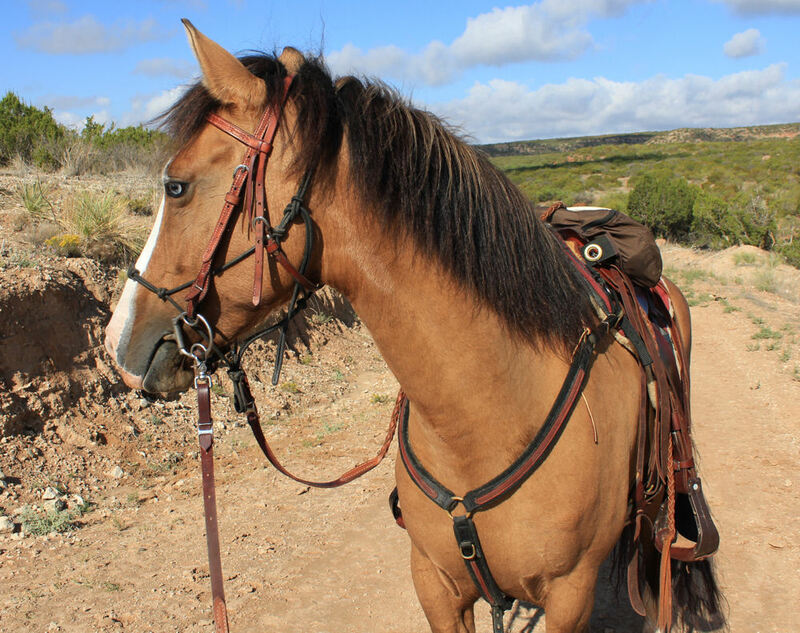 Hmm, now that sounds like fun and a good reason to return to ride at Pole Canyon Ranch again… not to mention other trails in the area such as Palo Duro Canyon State Park, Caprock Canyons State Park and Trailway, and Lake Meredith National Recreation Area. Brent Graef, Chris Graef, Pat, and Paulette. Taken Monday, Oct. 10th, 2011, waters from the Friday night/ Saturday morning rains have all ready soaked up; the creek is dry once again. 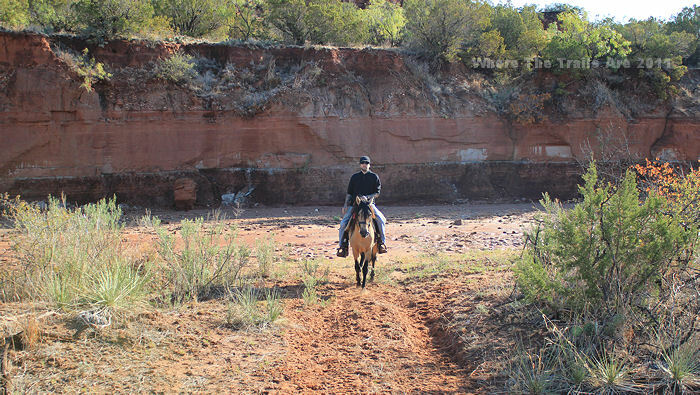 Scott on Cajun just in front of the muddy but dry creek bed, 10/10/11. Overlook at Pole Canyon from the high Panhandle plains, 10/9/2011. Two track trail not far from the ranch guest house and parking. 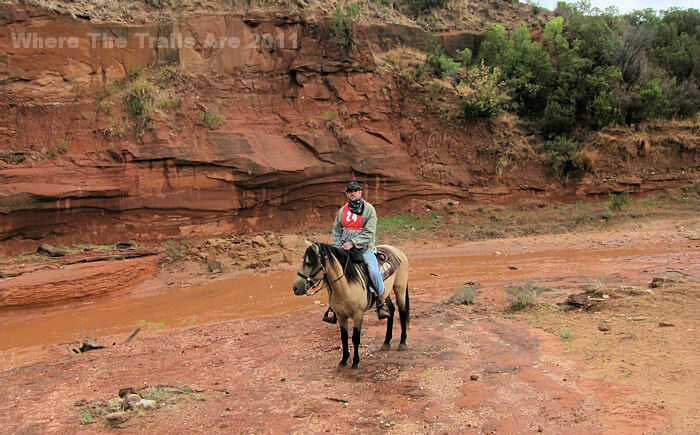 Scott and Cajun competing at the NATRC trail ride on 10/8/2011. Wildflowers blooming after much needed rain. My American Indian / Spanish Mustang, Angel, on her way back to the trail head. Thanks Angel for just a great ride!